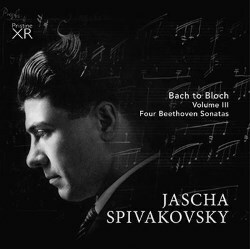 This is the third in a series of discs devoted to the private recordings of Ukrainian-born pianist Jascha Spivakovsky, the bother of Tossy. The previous volumes will give some biographical and other information (see reviews of volume 1 and volume 2) but, to be brief, they were either made in Spivakovsky’s Melbourne home or recorded from radio broadcasts. Of the Waldstein, which was contained in the first volume, I noted that it was ‘personal and individualistic with some telling rubati in the first movement and plenty of tonal graduation’. Now there are a quartet more examples of Spivakovsky in Beethoven, three more ‘named’ sonatas and Op.111. All these performances were recorded on a reel-to-reel tape recorder in mono, so that one needs to accommodate the ad hoc nature of the performances and to bear in mind that these are practice sessions, even though they are played straight through, or live broadcasts. There seems to have been intervention slightly to inflate the acoustic beyond the rather dry house acoustic, and that has been sensitively achieved, to harmonise between home recording (either on Spivakovsky’s Blüthner or Steinway pianos) and broadcast material. The Pathétique is technically commanding and with great clarity of texture, with daringly elastic phrasing in the slow movement and some Old School devices as regards agogics in the finale. His Moonlight (from a 1958 radio broadcast) makes no attempt to replicate Solomon’s heavenly length in the opening or Kempff’s treble-orientated lighter tonal palette, instead remaining balanced and unselfconsciously direct. There are moments of gaunt and dramatic intensity in the finale which reflect both the narrative of the music but also Spivakovsky’s chosen expressive intent. He remains, as he shows throughout this sonata’s slow movement and, unwaveringly, through the long course of Op.111’s finale, an exponent of unsentimental individuality who can marry rhythmic changeability with architectural imperatives. This c.1967 home recording was made when he was around 70. For specifics about the performances you will need to access Pristine Audio’s website because the disc itself gives only a paragraph overview of the works and performance – not that much one can say in seven lines – and then two lengthy quotations from Neville Cardus in the Sydney Morning Herald and John Sinclair in The Herald in 1947 regarding Spivakovsky’s concert performances. I rather wish recording details had replaced this blurb-like page so that one didn’t have to shuttle back to the internet. However, presentation of the music has been thoughtfully done, and we’re all still waiting for some Bloch.